Amazon is one of the biggest online retailer store that offers an affiliate program named as Amazon Associates. You can make lots of money by referring people to buy from Amazon through your affiliate links. I have written a complete guide on How To Make Money with Amazon Associates Affiliate Program, you can go through it to have a better understanding of earning money through Amazon. After earning the money in dollars, the next big thing is to withdraw it and get it into your hands as soon as possible. Amazon offers variety of ways to withdraw your hard earned affiliate income, the ways include Amazon Gift Certificate, Direct Deposit into Bank Account & Check. 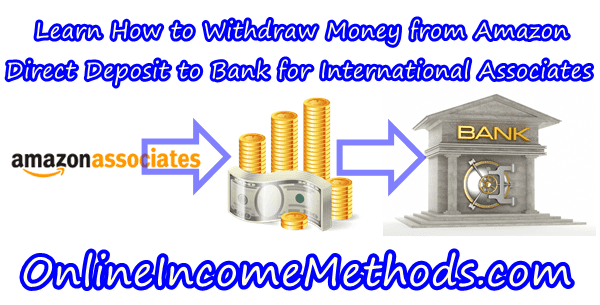 Amazon suggests USA based associates to withdraw money with Direct Deposit while International Associates which do not belong to USA can only use Check option to withdraw their affiliate income, since Amazon does not work with international banks. I am writing this article to help international amazon associates to withdraw money with direct bank deposit and its 100% legal way to do it. The best way to withdraw your money is through direct bank deposit, as its the fastest mode of retrieving your payments. Checks take quite longer to dispatch at your home address and further it will take lots of time to get your check cleared from the bank and finally have some hard cash in your bank account. Since International Associates usually do not have a bank account in USA, and Amazon only offers to withdraw money through direct deposit only using a USA based bank account. Where there is a will, there’s a way as well. Payoneer offers US Payment Service that could be easily used to withdraw your Amazon Associates affiliate income using your Payoneer Debit Master Card. US Payment Service can only be used by those people who have their Payoneer Account. Using this service you will be assigned a virtual bank account in USA, whose details are further utilized to receive payments on your Payoneer Account. Once your Amazon Associates payment is received in your virtual bank account, it will only take a week’s time to get cleared and some times it happens even more quickly. 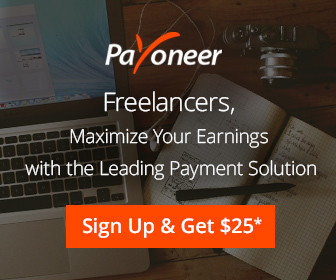 You can signup for Payoneer Account using the following special link, which will let you Earn Additional $25 Bonus as soon as your Payoneer account is loaded with $100 or more. After receiving your Payoneer Account, you can simply request Payoneer support to enable US Payment Service on your Payoneer account. They will ask you the reasons and you might be required to fill up a questionnaire. Mention that you are freelance worker or affiliate marketer and earn money through amazon associates affiliate program, if you do have a blog, mention the source of your blog in the same request. Once they will review your request, your US Payment service will be activated and you will be given following details at this US Payment Service Page as shown in an image. Once your US Payment Service gets approved by Payoneer, you have to enter the above mentioned bank account details from your Payoneer account into Amazon’s Payment Info Page, and save them, in the following way as shown in the image. Now you are eligible to withdraw your Amazon Associates Affiliate Earnings through Direct Bank Deposit by using Payoneer Master Debit Card. You will be charged 1% fee by Payoneer for using their US Payment Service. You can also Verify your Paypal Account with Payoneer once your card is loaded with money. 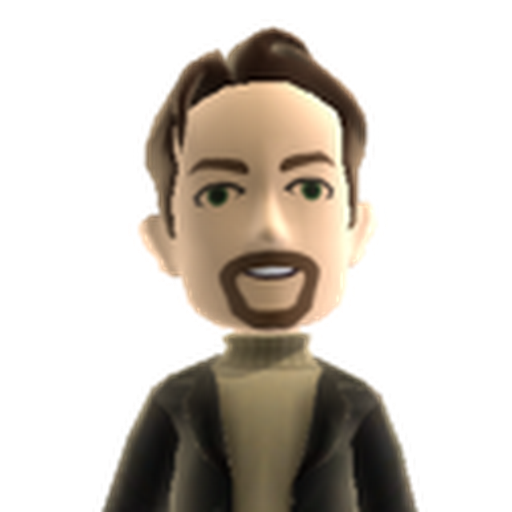 In addition to that you can also Start Earning Money with Payoneer’s Affiliate Program. 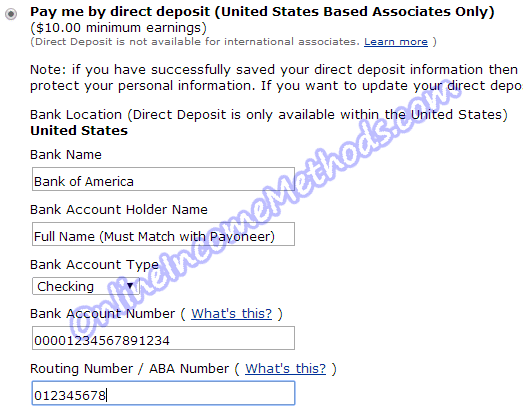 Note: Although the above image says that direct deposit is only for United States based associates only, however by using Payoneer’s US Payment Service, international associates who do not belong from United States can also withdraw money with Direct Bank Deposit. Its legal because you are using third party service to withdraw your affiliate income.